Beaumont Hospital incorporating St. Joseph's Hospital, Raheny, is a major teaching hospital providing an important Emergency Medicine and Trauma service together with National and Regional services in a number of specialties. The hospital is one of the eight designated centres for the development of cancer services in Ireland. The hospital employs circa 3,500 (whole time equivalent) staff and has a complement of 820 beds. Even though Beaumont Hospital has approximately 3,500 staff, every person who joins the organization will have every opportunity for career development and training. We aim to offer flexible working hours to fit in with the other demands that may be placed on staff time. Beaumont Hospital is an equal opportunities employer. Beaumont Hospital is now hiring Nursing Staff, with vacancies in all areas. 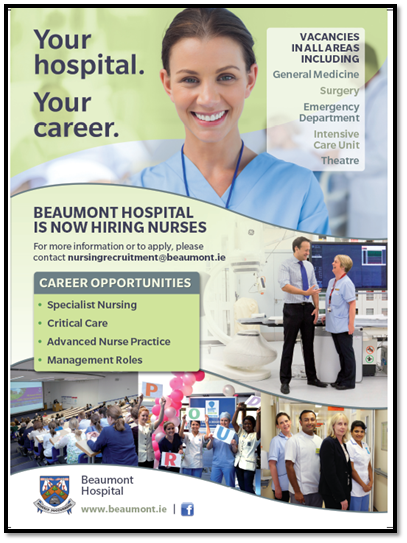 Please see below or visit our Nursing Careers web page or contact nursingrecruitment@beaumont.ie.